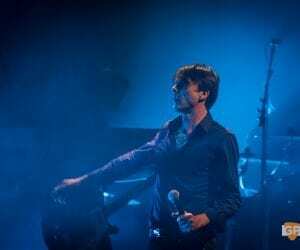 Suede concluded their Blue Hour tour in The Bord Gáis Theatre with the vim and verve of a band half their age. 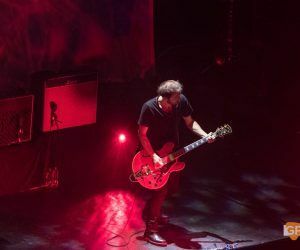 After 8 albums and a B-Sides collection that was once described as being better than ‘OK Computer’, the Londoners – whose 30th anniversary is on the horizon – seem to have cast off the shackles of expectation that comes with the limelight of the zeitgeist. 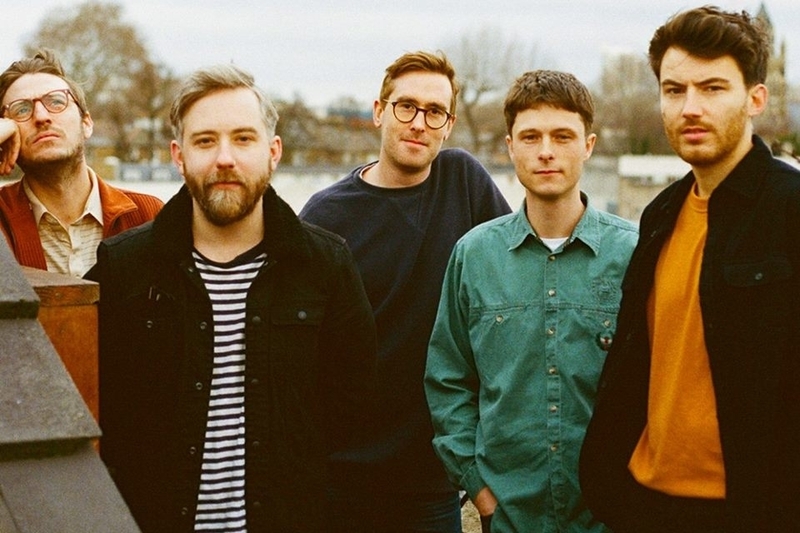 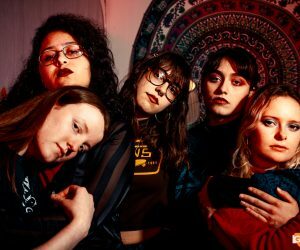 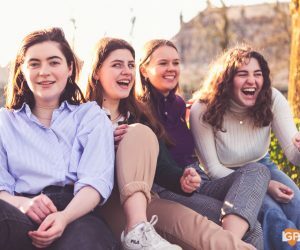 The one-time NME darlings (when that still meant something) now have nobody to impress but their existing fans and themselves, and to that end they couldn’t be accused of taking their second grasp of the nettle lightly. 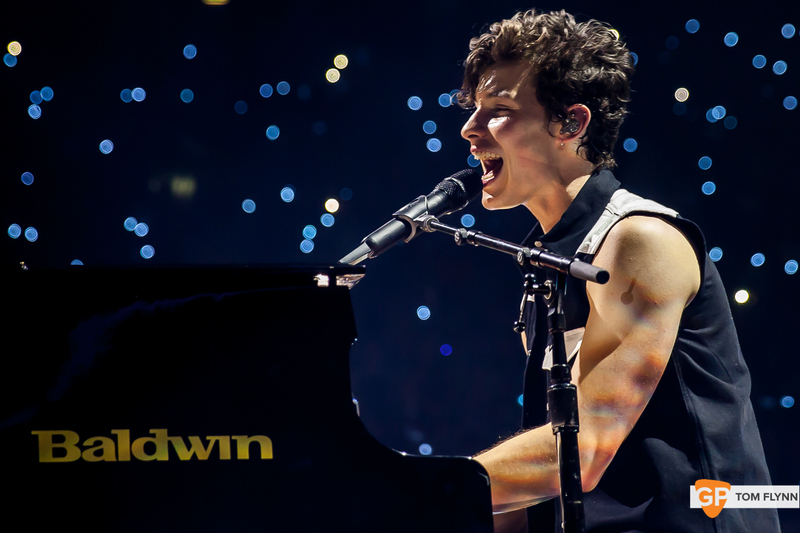 If anything, they’ve pushed themselves harder than ever before, safe in the knowledge that whilst they continue to respect their fanbase, their fanbase will be along for the ride. 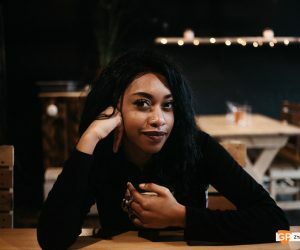 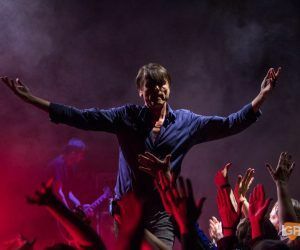 Comebacks are tricky things to manage, as we saw with The Stone Roses, because all the love in the world will recede if the magic is no longer in their fans’ ears and hearts. 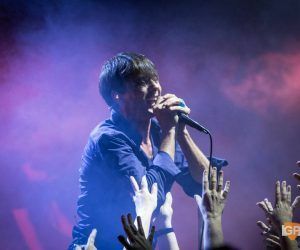 Suede, on the other hand, have managed to harness their fanbase’s goodwill and fan it with 3 albums of music worthy of their attention. 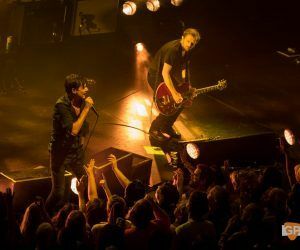 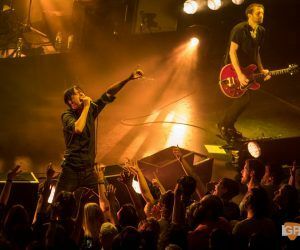 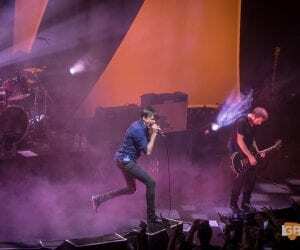 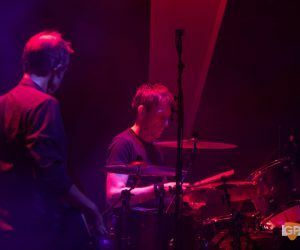 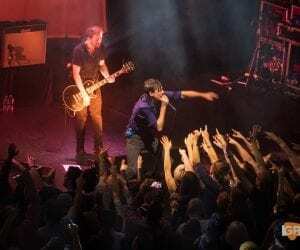 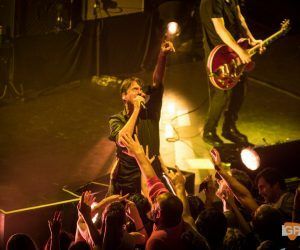 Suede have also piqued their fans’ interest by creating interesting live experiences to accompany their new music. 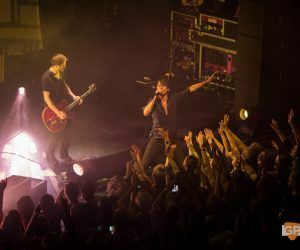 And their latest outing on the road is probably their most insatiable one since their reformation. 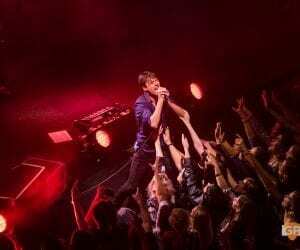 There is a new grit on display in the Bord Gáis Energy Theatre not previously present. 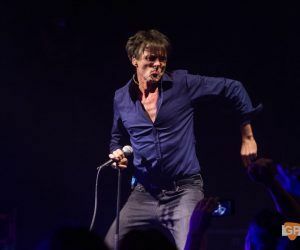 There was always determination on display but there’s a chest beating “let’s be having you” passion that’s come to the surface. 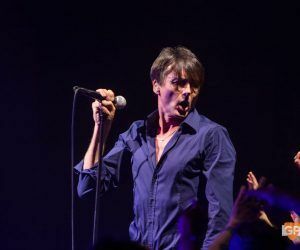 This is especially noticeable in Brett Anderson’s vocals, and in the glammed-up guitar lines which crank in the way you’d imagine that Mick Ronson and The Spiders From Mars once did. 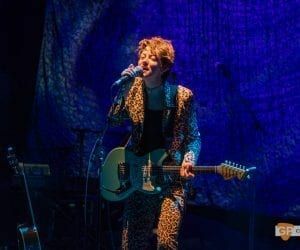 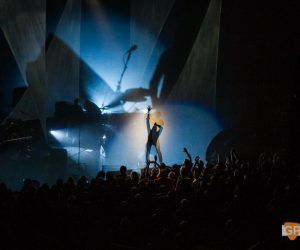 Indeed, the spectre of Bowie seems to be embraced like never before, with Anderson’s speak-sing vocal revamp of songs such as Beyond The Outskirts reminiscent of Bowie’s Time; perhaps his absence rekindled their love for the Thin White Duke. 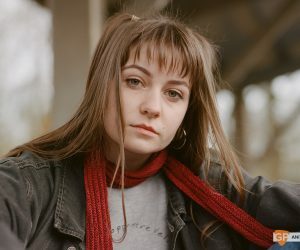 It could certainly be felt on the spoken word poem Roadkill. 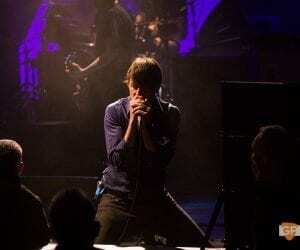 He’d certainly approve of the theatrics. 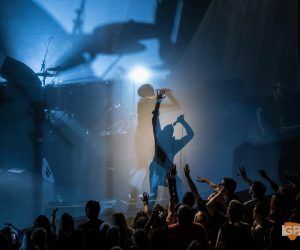 The show opens with the band behind a screen which throws their shadows in several directions, creating an optical illusion for the audience. 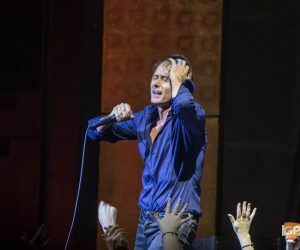 And this is used to great effect as the Soviet rinse of the opening bars of As One sets the tone for ‘The Blue Hour’ to unfurl. 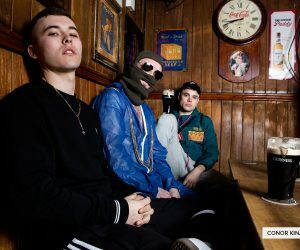 As with previous album ‘Night Thoughts’, their latest album is far from instant and needs repeated listens to fully submerse yourself in its world. 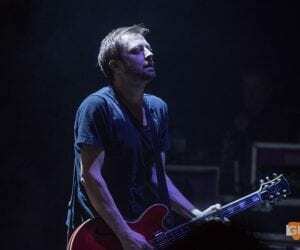 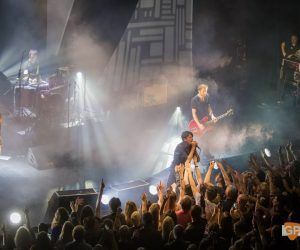 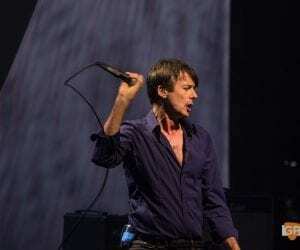 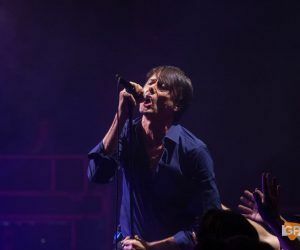 Thankfully the epic qualities of the album are more instant in a live setting and Suede carry their fanbase across its opening trio with aplomb – the rewards of persistence are reflected by the gush of enthusiasm ‘Night Thoughts’ single Outsiders is greeted with, as if it had suddenly come of age. 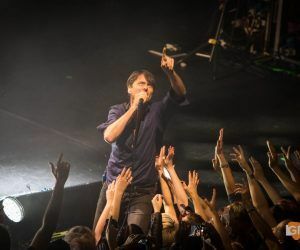 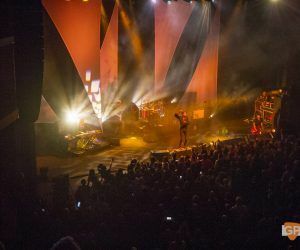 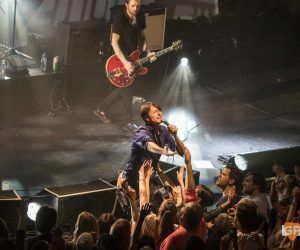 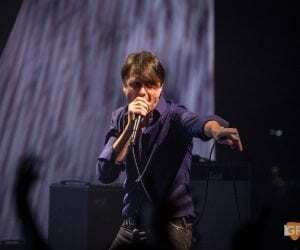 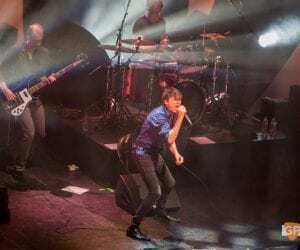 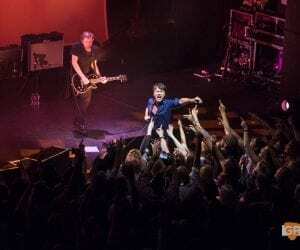 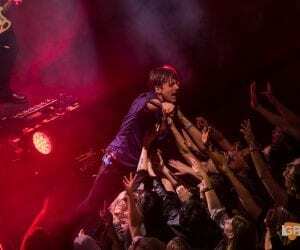 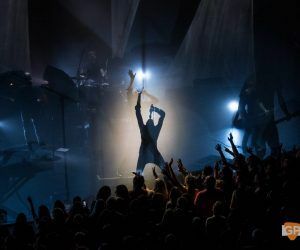 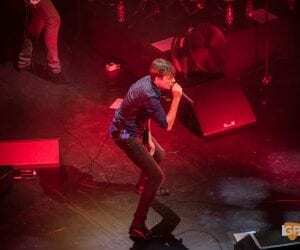 The to-ing and fro-ing between old and new material is well balanced, allowing fans and Brett Anderson to engage in their traditional antics. 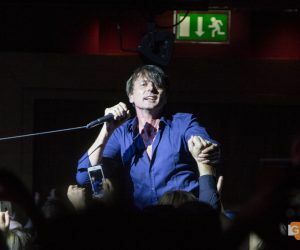 Although the Bord Gáis is a seated venue, it may as well have been a standing event – 200 fans make it down the front and under the screen and the seated masses would soon join in by getting to their feet. 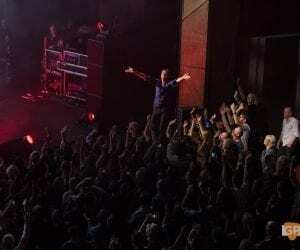 Anderson would make the most of this arrangement on several occasions, going for a little walkabout and standing on a seat belting out Lazy. 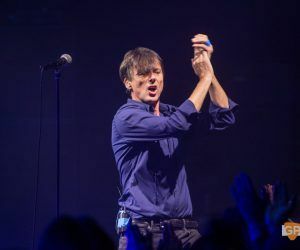 The was also time for the traditional lasso display – as Anderson would remind us later on, “this is a pantomime” after all. 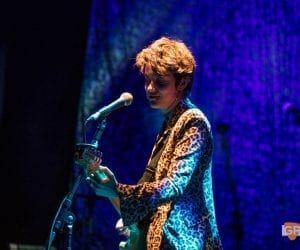 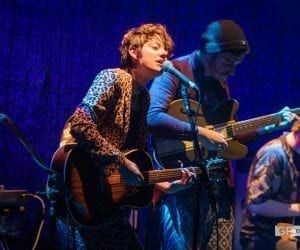 A solo acoustic off-mic rendition of Saturday Night recast the hit single in a beautifully dour dye, showcasing Anderson’s vocals if not, in his own words, his guitar playing. 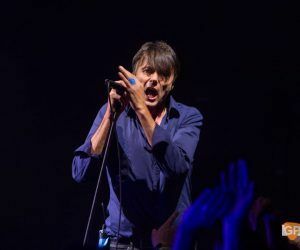 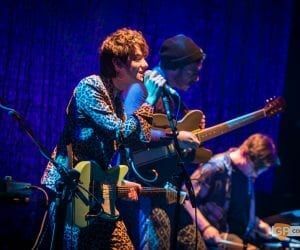 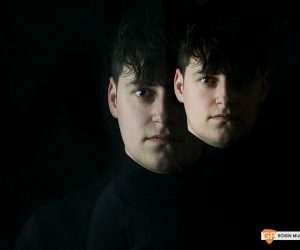 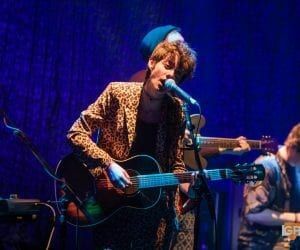 Richard Oakes on the other hand showcases his wares on songs such as Filmstar and the expansive Flytipping, which culminates in a charged wig-out between the band as Anderson went to powder his nose. 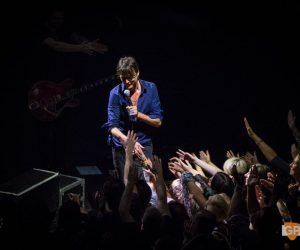 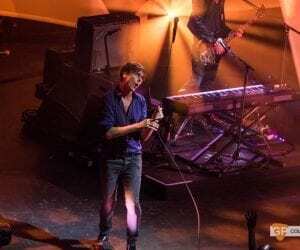 We are led to believe that music is a young man’s game, but as they enter their fifties Suede are rewriting the rulebook. 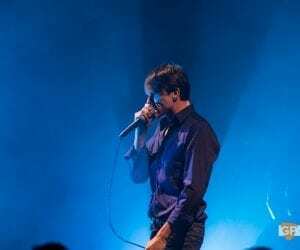 May the Blue Hour last for a very, very long time.